> The 200m, 400m and 800m Freestyle events will be offered on multiple nights so swimmers will have the opportunity to swim the event on one of the three nights. 200m Freestyle will be offered on nights 1 & 2, 400m Freestyle will be offered on all three nights and 800m Freestyle will be offered on nights 2 & 3. SWIMMERS CAN ONLY SWIM A DISTANCE ONCE, THEY CAN NOT SWIM MULTIPLE EVENTS FOR THE SAME DISTANCE. > Splits will be available for the 800m Freestyle in the 1500m Freestyle & 400m Freestyle in the 800m Freestyle only for results only not for Club Championship points. > Make up swims will be available for swimmers competing in swimming only events outside of the immediate area (further than 300 kms) for either the night of or the next day following 1 of the 3 Club Championship Sessions. No makeup swims will be available to swimmers competing in other sports. Massive congratulations to all the swimmers that competed at the North Coast Champs over the weekend. Outstanding efforts from all the swimmers were achieved with hundreds of personal bests and many medals being awarded. Riley Andrews 12 yrs age champion. 3 swimmers achieved 9 new Championship records including Millie Edwards-Bradshaw(4), Shayden Loone(4) & Riley Andrews(1). Top point scorers for the Club were Lilly Geddes 392 points, Riley Andrews 325 points & Millie Edwards-Bradshaw 322 points. Girls 12 yrs & U 4×50m Medley (Millie Edwards-Bradshaw, Bella Teale, Riley Andrews & Tylani Hickman). Girls 12 yrs & U 4×50m Free (Millie Edwards-Bradshaw, Riley Andrews, Lilly Geddes & Tylani Hickman). Girls 14 yrs & U 4×50m Free (Ella Bhatti, Benny Maloney, Imogen Richards & Tayah Teale). Boys 10 yrs & U 4×50m Free (Beau Willoughby, Toby Alford, Boaz Yardley & Finn Pengelly). 33 Coffs Club (pool) records were broken including some more than 30 years old. The meet was the largest Regional Area Championships in NSW this year and once again for the 8th consecutive year, Coffs Club was able to host it. In 2011 when the Far North Coast and Mid North Coast Swimming Associations merged to become Swimming North Coast, Coffs hosted the inaugural Championships. 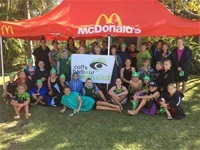 That year Coffs was represented by 3 swimmers and only a handful of committee members, however this year the Club offered 81 swimmers for the event and the most exciting result was that Coffs won the overall point score with over 8000 points, 1600 points ahead of Trinity and Port Macquarie Clubs respectively. These are exciting times for the Club which at present is the 6th largest Regional Swimming Club in NSW with a membership base reaching up to 300 members. A large component of the growth & success in the last 8 years can be attributed towards the five coaches affiliated with the Club: Eugene Brogmus, Dean Laurence, Daniel Bannerman, Kim Roach & Colin Sawtell. Their commitment and dedication to the swimmers and their families have been paramount to the ongoing success of the Club. The committee is extremely grateful towards their continued investment within the Club. A special mention to all the committee members of the Club including Jim Phipps(Vice President), Lisa Alford(Treasurer), Donna Briley(Race Secretary), Helen Phipps(Registrar), Vikki Potgieter(Secretary), Daniel Bannerman, Gemma Bannerman, Amanda Mordue, Megan Pengelly, Chris Kirkaldy & Kylie Marle. All these people are behind the scenes laboriously working towards the success and prosperity of the Club that it has evolved into. Over the weekend every parent at some stage assisted in time keeping, BBQ duties, food trolley & technical official duties. Bless you all. Special mention must go to Donna Briley as Race Secretary for her unbelievable commitment to that role. Lisa & Steve Alford for overseeing the BBQ and many helpers. Gemma Bannerman for the food trolley organisation & most notably Amanda Mordue & Chris Kirkaldy acting as Team Managers for the weekend. Massive pat on the back guys. Swimming North Coast have nothing but positive comments regarding the success of the weekend and are more than happy for our Club & the Coffs Pool to host future events. Once again thank you to everyone involved that makes our Club the Champion of the North Coast. AT LEAST ONE PARENT/GUARDIAN MUST ALSO REGISTER FOR APPLICATION TO BE APPROVED.